Carrolls Irish Gifts are a fully Irish owned company established in 1982 and are one of the leading retailers of quality Irish clothing, jewelry, souvenirs and gift product. If you have visited Ireland, you will have surely seen or visited one of the many famous stores. They stock leading Irish products such as Guinness, Aran Knitwear, Solvar, Trinity, Mullingar Pewter and many more. They also carry 1000's of gift and souvenir products across a wide range of categories. In 2014 they celebrate 32 years in business delivering the highest standards of customer service and a massive range of top quality products at the keenest prices. This is one of three penny machines at Carrolls in Dublin. This location is a 5 to 10 minute walk north just across the Liffey river from the 15 Westmoreland store and is across O'Connell street from the 33 Lower O'Connell street location. It's about a 20 minute round trip (excluding rolling time) walk to all 3 shops. Store hours: Monday - Saturday 9:00am - 9:00 pm (21:00). Sunday 10:00am - 9:00 pm (21:00). This machine's designs are identical to the machine designs at the 15 Westmoreland store. The Claddagh ring (Irish: fáinne Chladaigh) is a traditional Irish ring given which represents love, loyalty, and friendship (the hands represent friendship, the heart represents love, and the crown represents loyalty). 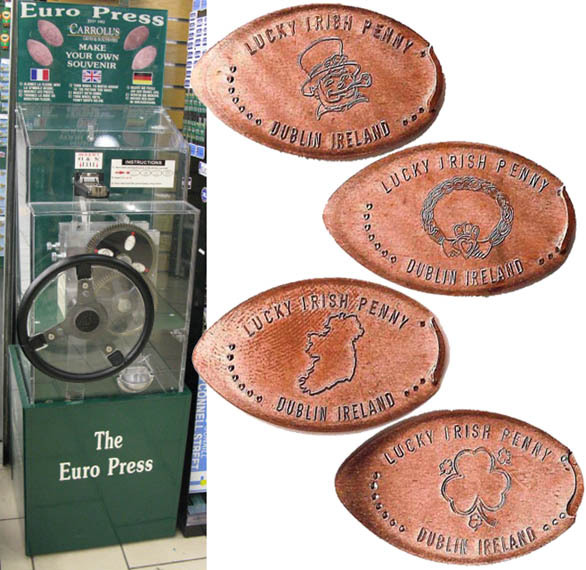 Four designs available from a "The Penny Press" wheel cranked machine. Each cost €1 plus the Euro 5 cent piece that you supply. 2. (H) Ireland map outline. 3. (H) A Claddagh ring with 'love' inside the ring. 4. (H) Shamrock surrounded by 3 smaller shamrocks. G.P.S. coordinates: Latitude: 53° 21' 2.0952" Longitude: -6° 15' 39.51"
This machine is identical to the one in the Westmoreland street store.